Just about 67 miles west of the Denver Airport you’ll find the mountain towns of Dillon and Silverthorne. While these destinations don’t have their own airport, there are a number of options for getting from Denver Airport to Dillon, including Dillon airport shuttle, taxi services, Bustang, car rentals and more. The trip from Denver Airport to Dillon or Silverthorne takes you west on I-70 through downtown Denver, under the Eisenhower Tunnel to Silverthorne. Eagle County Regional Airport is located west of Vail in Gypsum. Just about an hour from Dillon & Silverthorne, EGE is a great option to cut your drive time down, but there are a few downfalls. Flights often get delayed or cancelled during the winter because of the weather. There are also much fewer transportation options between EGE airport and Dillon. To get from Eagle County Airport to Dillon, you’ll head east on I-70 past Beaver Creek, Vail, Copper and Frisco to the Silverthorne exit, where you’ll exit and head north towards Silverthorne or south towards Dillon. About 2 1/2 hours southeast of Dillon is Colorado Springs and the Colorado Springs Municipal Airport. To get from the airport to Dillon or Silverthorne, take I-25 N to Denver, where you’ll head west once you reach I-70. Follow I-70 through Denver, up to the Eisenhower tunnels, and back down toward the Dillon / Silverthorne exit. We not operate shared shuttles between Dillon and the Colorado Springs Airport, however, private shuttles are available. Peak 1 Express offers safe and affordable Summit County Airport Shuttles from Denver International Airport to Dillon and Silverthorne, Colorado. Our Mercedes Sprinters provide you a safe vehicle with loads of extra legroom and headroom, and our service-focused drivers will provide you the best ride. We offer our daily, shared, mountain shuttle schedule and daily airport charter service between DEN and Dillon at the custom time of your choice if the listed times do not suit your needs. Silverthorne, Colorado offers true convenience! Just minutes from Copper Mountain and Keystone Resort and only slightly further to Breckenridge and Arapahoe Basin, Silverthorne provides an easy home base for all your activities with lavish rental homes plus affordable hotels and condos. Looking for airport transportation to Silverthorne? Silverthorne airport transportation from Peak 1 Express offers access to the Outlets at Silverthorne where you can find fantastic shopping as well as casual dining options. Please note that there will be other stops to accommodate other guests. Staying in Dillon, CO makes it easy to access all the mountains have to offer. In the winter Dillon is centrally located to all the ski areas in Summit County such as Breckenridge, Keystone, Arapahoe Basin and Breckenridge. All are about 15-20 minutes from Dillon. The town is also one of the most affordable for lodging and offers a variety of lodging options, including houses, condos and hotels. In the summer you can enjoy hiking and biking around Lake Dillon or on any of the mountains nearby. Catch the Dillon shuttle to and from the airport with Peak 1 Express to make your trip simple. Please note that there will be other stops to accommodate other guests. There are a thousand good reasons why Breckenridge, CO is one of the most popular mountain resort destination areas in Colorado and in the U.S. You’ll find a wide variety of Breckenridge, Colorado lodging options that will work for almost any budget, from shoestring to unlimited. Check out our Breckenridge lodging information for the locals’ insider perspective from the Peak 1 Express local residents! Craving some delicious food after your day out on the hill? You will not have to travel far as Dillon and Silverthorne both have quite the variety of dining options, from sushi to steaks, burgers to Mexican. With local favorites that are in walking distance, plus a few chain restaurants that you will recognize, these towns can accommodate just about every taste. Great breakfast spots, coffee shops, and of course lunches and dinners that will be sure to satisfy any hunger craving you, or your family may have. Don’t let the lack of ski resort in these two towns fool you, they’re full of life year round and merely seconds away from the slopes! Head here to sail the reservoir or take part in some fun festivities. Adopt An Angel: Going on 24 years, this event takes place at the Silverthorne Pavilion where thousands of gifts will be given to families in need. Holiday Bazaar: In the beginning of December, local artists head to the Pavilion to sell their work. If you’re lost as to what to get your loved ones for Christmas, you don’t want to miss this! Brewer’s Rock for Rescue: This fundraiser for the Summit County Search & Rescue group features beers from plenty of local brewers. Enter a silent auction full of items for backcountry safety and enjoy some live music and great beverages. Twilight Skate: A fun and free evening on the North Pond Park! Skate around under the stars and warm up with some chili afterwards. PBR Pond Hockey Tournament Apres Ice Party: Post Pabst Blue Ribbon hockey tournament, kick back to some live music and cold brews. Dillon Farmers Market: Every Friday throughout the summer months, Dillon hosts one of Colorado’s largest open air markets with live entertainment, fresh produce, and delectable meats from all around the area. Lake Dillon Brew Fest: The Dillon Marina Park holds this beer festival every year, where you can sample brews from over 25 Colorado breweries and catch incredible views of the reservoir. Bear Bolt 5K Race: Hosted by Silverthorne Elementary, this race ends with a potluck at Rainbow Park and is a fundraiser for the school. Kaiser Permanente Pumpkin Fest: Bring the kids to Rainbow Park for a fun fall day, complete with a bounce house, petting zoo, carriage rides and a free pumpkin patch. Dillon and Silverthorne are the perfect Rocky Mountain retreats. 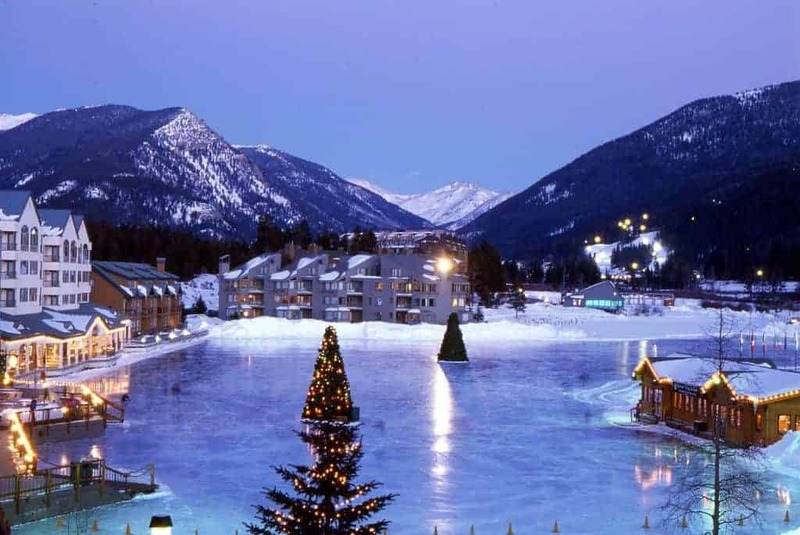 Within a half hour from Copper Mountain, Keystone, Breckenridge, and Arapahoe Basin, and less than an hour to Vail and Beaver Creek, these towns are truly located in the heart of the mountains with easy access to many great destinations for a couple looking to get away, or a family looking to spend some quality time creating memories to last a lifetime. While you’re visiting, you can head to the outlets for all your shopping needs. Whether you forgot something at home or looking to take a break from a day on the hill, the nearly 70 outlets have something for everyone. In addition to the great skiing and shopping, there are plenty of nordic skiing trails as well as snowshoeing trails for experienced or novice adventurers. You can definitely find a trail to meet your needs of the day whether you want to go out all day or just for an hour. After a nice snowshoe, drop by the natural ice rink. With a warming hut that provides a great view of the rink, bring some hot chocolate and snacks while you watch the kids skate. The towns of Silverthorne and Dillon offer countless options for those visiting during the winter and ready to adventure away from the ski slopes. From Ice Skating at North Pond Park, the majestic Ice Castles on display every year in Dillon. Celebrating the holidays at the Lighting of Dillon, Ice Fishing on Lake Dillon, or snowshoeing through local trails while taking in nature and observing local wildlife are just a few of the experiences awaiting visitors of the Silverthorne/Dillon area during the winter season. While skiers and snowboarders flock to Silverthorne and Dillon to be surrounded by world-class ski resorts in the winter, as the seasons change, a whole new world of recreation and activities await those who choose to visit in the summer. Mountain biking, golfing, boating, and fishing are just a few of the summer options that both locals and visitors enjoy every year. With over 25 miles of shoreline, Lake Dillon is an incredible source of summer fun. The Dillon Marina is higher than any other deep-water marina in the world and offers boat rentals, lakeside dining, and world class sailing. For those looking to stay on dry land, the Raven Club Golf Course, Lake Dillon Disc Golf Course, or mountain biking on the Dillon Dam Recreation Path are all sure to deliver memorable outdoor experiences. When visiting Silverthorne or Dillon in the summer be sure to check out the lakeside Dillon Ampitheatre that features free outdoor concerts on Friday. It’s hard to name a more beautiful time of year in Silverthorne and Dillon than fall. With Fall comes incredible scenes of yellow aspens, mild temperatures ideal for making the most of the remaining warmth before winter returns. Renting a boat from the Lake Dillon Marina can be a relaxing way to spend a day flaoting around Lake Dillon while taking in the fall colors. Silverthorne’s Blue River is a favorite spot to cast a fly-fishing line in search of trophy trout and even lure-fishing along the banks is a popular fall activity here. The Dillon Farmers offers a great selection of local-grown, farm-fresh produce, and various forms of entertainment to enjoy. The Farmers Market is is open up until mid-September which makes it a terrific way to spend a fall Friday morning. Between taking a pontoon out on Lake Dillon to take in the fall foliage, fishing for trout along the Blue River, horseback riding through the Gore Range, or experiencing local produce at the Farmers Market, there are so many terrific way to spend your fall days in Silverthorne and Dillon. Located just about an hour down I-70 from Denver, it’s an easy shuttle ride to get to Silverthorne or Dillon from the airport.Both of these communities are uniquely located between several world-class ski resorts while offering endless fun right there within their own borders. Here’s layout and some tips that will help you make your way around these amazing mountain towns. Located right along Interstate 70, Silverthorne is essentially in close proximity to five different premiere ski resorts. Keystone, Breckenridge, Vail, Copper, and Abasin are all within an hour of Silverthorne and many visitors find it to be the perfect central location to reside at during their vacations. For those looking to set the skis down and do some shopping, the Silverthorne Outlets is the perfect place to visit a wide range of stores all in one place. the Outlets at Silverthorne are located right in the heart of the town and is a simple 20 minute drive from the five nearby ski resorts. Many visitors plan an extra day into their ski trip to just check out these fantastic stores. Nestled right on the shore of Lake Dillon, a beautiful outdoor amphitheater that hosts free concerts on Friday and Saturday nights in the summer awaits all time of concert goers looking for entertainment. Incredible evenings filled with music and views of the Rocky Mountains await anyone that visit this stunning venue. Yoga, movie nights, and more are just a few other activities that all take place at the Dillon Amphitheater giving it a diverse list of events that has something for all types of visitors. To say this marina is special isn’t doing it justice. The Dillon Marina is the worlds highest deep water marina! Whether visitors are looking for a pontoon, a sailboat, or a kayak, they will be able to rent and get on the water with a variety of available boat rentals. After spending time out on the water soaking in the many views visible from Lake Dillon, water-goers can wind down at the many incredible lakeside restaurants like Pug Ryan’s which has a great deck to enjoy food and refreshments on.